The downtown brewery is stepping up to the plate this holiday season by throwing a benefit concert on Friday to help three employees whose jobs went up in flames during a recent fire behind Satchel’s Pizza. Longtime customers at Satchel’s Pizza recognize Jordan Borstelmann as the bartender donning a kilt, a bushy beard and a huge smile. For more than five years, he poured drinks and served food in Lightnin’ Salvage, the entertainment venue and gift shop/toy store situated directly behind the Gainesville pizza joint at 1800 NE 23rd Ave.
On Monday, Dec. 5, a fire engulfed Lightnin’ Salvage and destroyed one of Gainesville’s most iconic hangout spots, where collections of dead butterflies and pine cones shared a home with artwork made from recycled cameras, cellphones and other household items. The blaze, which occurred when the restaurant was closed, also left Borstelmann, 36, and fellow Satchel’s employees Danny Lore and Judy Keathley out of jobs. However, thanks to the generosity of First Magnitude Brewing Co., Borstelmann and his co-workers should still be able to enjoy the holiday season and beyond. On Friday from 4-10 p.m., the brewery at 1220 SE Veitch St. will sponsor a benefit concert to raise funds for the three Satchel’s employees while Lightnin’ Salvage is being rebuilt. Five bands will perform in the beer garden throughout the evening, including some that appeared regularly at Lightnin’ Salvage. The lineup includes Boilin’ Oil (4-4:45 p.m.), Mr. Aullie/Cracker the Box (5:15-6 p.m.), Front Porch Back Steppers (6:30-7:15 p.m.), The Jazz Bandits (7:45-8:30 p.m.) and The Impostors (9-10 p.m.). What was left of Lightnin’ Salvage after the Dec. 5 fire. The event will also include a raffle of donated items, including some that survived the Lightnin’ Salvage fire. Food vendors will include Bubba Luigi’s Roadtrip, Stubbies’ Pop-Up Sausages and Dank Cakes. The entertainment is free and open to the public, but a $10 donation will get you a glass of craft beer, a raffle ticket and discounts on merchandise just in time for Christmas. John Denny, one of the co-founders of First Magnitude Brewing Co., said helping the Satchel’s crew was a no-brainer. His wife, Christine, first suggested the idea of a fundraiser. “We were deeply saddened to hear about the fire and wanted to do anything we could to help out,” he said. Satchel Raye, the pizza restaurant’s namesake, said he is grateful. The owners and employees at First Magnitude and Satchel’s Pizza have become close friends the past couple of years. 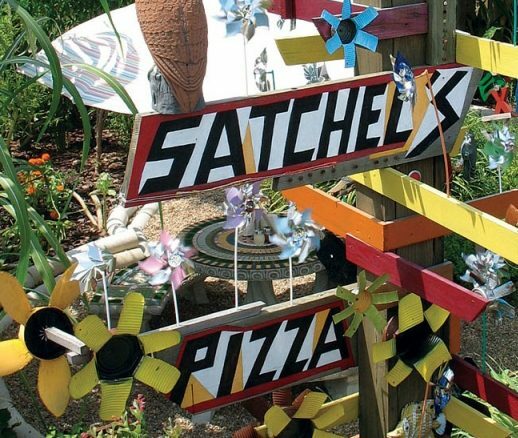 Raye, who opened Satchel’s Pizza in 2003, had offered friendly advice to First Magnitude’s owners when they were preparing to open the brewery in early 2014 and then he hosted the brewery’s first “tap party” later that year. More recently, the two local businesses have collaborated on constructing a Habitat for Humanity home in east Gainesville. That project is ongoing despite the fire that destroyed Lightnin’ Salvage and its kitschy and eclectic belongings. 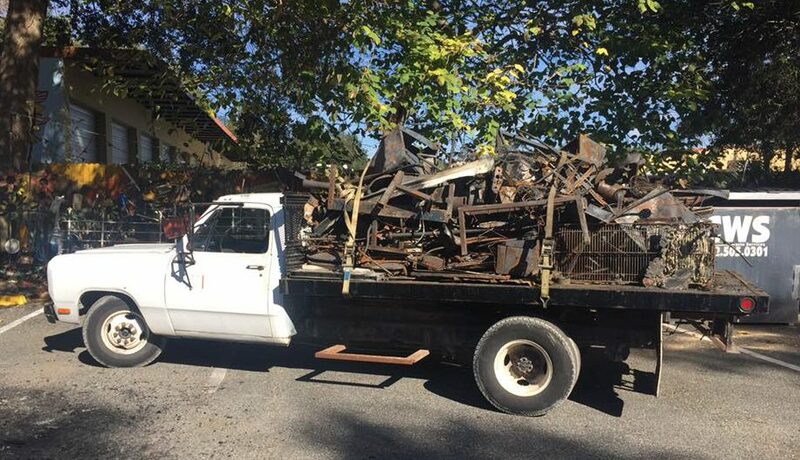 A truck loaded with charred debris from the fire at Lightnin’ Salvage. The fire claimed all the vintage merchandise in the gift shop, including everything from fake moustaches and ViewMaster viewers to ubiquitous Satchel’s bumper stickers. Among the items destroyed in the fire was a stained-glass window created by First Magnitude co-founder Wells The Losen that depicted Satchel’s old Ford Falcon van that doubles as a dining car in front of the restaurant. Raye said he was heartbroken about the fire and all that was lost in it. The fire destroyed Lightnin’ Salvage and its “Junk Museum,” a storage area, freezers and an old oak tree and treehouse behind the business, but the pizza restaurant in front was still able to reopen within a week. In 2012, Satchel’s closed for several months following a fire that gutted the kitchen. The recent fire, however, has had an adverse effect on business. Raye said revenue is “down about half” from usual. He attributes that to sales lost in the gift shop as well as food and beverages sold in Lightnin’ Salvage to no longer having a covered area for people waiting for tables. 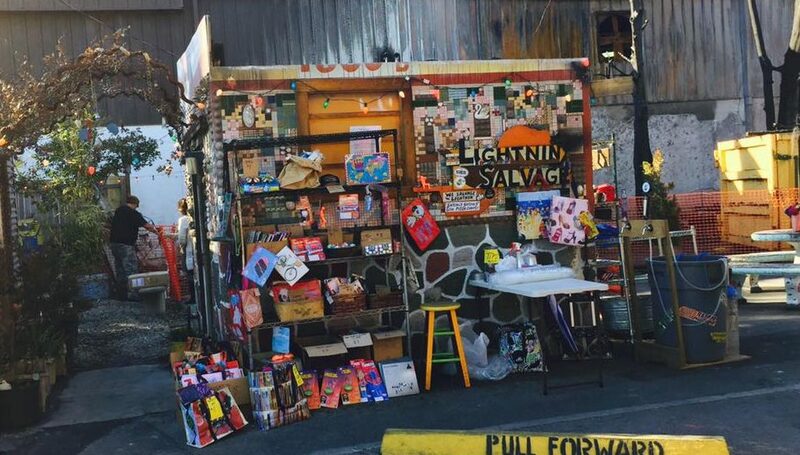 The good news is that Raye has already consulted with an architect, surveyors and contractors on constructing a new home for Lightnin’ Salvage Enterprises to open next year. 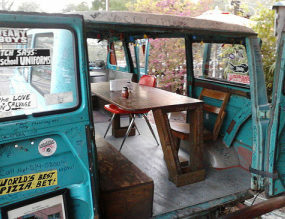 The dine-in van at Satchel’s Pizza. And, of course, Borstelmann will again take his position behind the bar. In the two weeks since the fire, Borstelmann has helped with the arduous cleanup efforts. While sifting through the ashes, he found a wooden alligator that had been attached to the side of a booth. He said the slightly charred memento will likely find a home inside the new Lightnin’ Salvage. Borstelmann, who is also a skilled blacksmith, said what he misses most about Lightnin’ Salvage is the energy and family-friendly atmosphere. “I felt like I was the host at the best party in Gainesville five nights a week, listening to the music, talking with customers and watching the kids running around,” he said. Friday’s benefit concert at First Magnitude Brewing Co. is designed to help Borstelmann, Lore and Keathley get through the lean months ahead. Raye said that the three displaced employees’ salaries are covered through the end of the year and is humbled that First Magnitude came up with the idea for the benefit concert. Raye is well known for his philanthropic efforts. Each year he donates all proceeds from his ATM fees to local nonprofits, including the construction of the Habitat for Humanity house. His Satch Cash and quarterly SatchGrant programs have provided funds to dozens of local charities and agencies. Borstelmann added that Raye has also been incredibly generous to his employees and the community over the years. For further info about the restaurant and the collections lost in the Lightnin’ Salvage fire, visit the Satchel’s Pizza website. For further info about the brewery, visit the First Magnitude Brewing Co. website.